Like everyone nowadays, I can predict everything except the future. But if MPs reject the government’s Withdrawal Agreement (whenever it ends up being put before the Commons), there is one outcome that many are campaigning for: a second referendum. It is particularly supported by Remainers, who see it as the only democratically legitimate way to overturn the result of the first referendum, and so provide an exit from Brexit. From former prime ministers down, the cries for a so-called ‘People’s Vote’ are becoming deafening. The arguments in favour can be persuasive: we now know (sort of) on what terms we will leave the EU, we know more about Brexit, the public mood is changing: give the people a final say. But Remainers wanting a second referendum – and not all do – should be careful what they wish for. A second referendum would be far more divisive than the first, possibly leaving a permanently scarred country. And it would also almost certainly fail to overturn Brexit. A second referendum would be more divisive than the first because it would start from a point where people’s positions are already entrenched. It won’t be about wavering voters making up their minds based on reasoned debate (or even lies), but rather a tug of war for supremacy between two political tribes. Passions across the population have been aroused. For many there would be a feeling of betrayal by the political class, who have refused to deliver what the voters asked for. Among an already disillusioned electorate, it could snuff out any lingering faith in democracy. Politicians across the spectrum are already warning it would lead to civil unrest as activists give up on the ballot box and frustration boils over. Westminster was surprised after the Scottish referendum how the nationalist spirit – once roused – just carried on, fuelling the SNP to political supremacy. I personally hate living in an already fractured country with such a passionate issue dividing families, friendships and communities, and that would just get worse. I want the country to start healing, uniting and moving forwards. Remainers are keen on the second referendum because they believe they can win it. They point to polls showing a narrow majority now oppose Brexit. But polls are erratic and actually the remarkable thing about them is how little they have moved, given the turbulence of the last two years. It is more noticeable that people have entrenched their positions rather than changed them. Polls also get it wrong: they almost all predicted Remain would win last time. But the main difference is that – unless we have a change of government first – the government will this time campaign for Brexit rather than against it. In 2016, the entire establishment – all the major political parties, the government, the main industry, consumer and trade union groups and academia – were generally united in their support for Remain. This time round, the government can pull all the legal levers at its disposal to campaign for Brexit. This would also mute opposition from much of the rest of the establishment groups, such as industry bodies, who hate to campaign against the government of the day. Although Remainers can point to the chaos of the negotiations, I think the Brexiteers narrative would be more strengthened than theirs. The sense of betrayal among Brexiteers would be a big motivator on the campaign trail, getting them out and knocking on doors, and arm them with a compelling narrative on the doorstep that you can’t trust the self-serving elites. The Remainers would have to face charges that they are sore losers who refuse to listen to voters – and nobody likes a sore loser. The public mood may be to shout louder: didn’t you hear us first time? Remainers say we now know far more about Brexit than we did two years ago. But do we really? Matthew Parris declared recently that ‘Brexit has failed’. But Brexit hasn’t even happened yet. What we do know for certain is that the recession that was predicted in the immediate aftermath of a vote for Brexit didn’t happen. We also found that negotiating with 27 countries while led by a government without a majority, a deeply split party and a fractious parliament is very difficult. We have learnt that divorce negotiations are painful, but that doesn’t mean people should never get divorced. None of that tells us much about Brexit itself. All we have left are predictions, just as we had two years ago. Finally, I think many Remainers underestimate the deeply rebellious mood of the great British public. The Brexit referendum was the first time in British history that the public voted for change against the government’s wishes. In every other referendum, they either voted for the status quo and rejected change (Northern Ireland 1973, EC membership 1975, AV 2011, Northern assembly, Scottish independence 2014), or when they did vote for change they voted the way the government wanted them to (Good Friday agreement, Welsh Assembly 1997, London Mayoralty, Scottish Government). For voters to reject the government and the entire weight of the establishment, and ask for a change as dramatic as Brexit shows an historically unprecedented rebelliousness. And I see no sign that it has dissipated in the last two years – rather the reverse. Remainers, be careful what you wish for. That would depend on the precision of the 'leave' option. If it's as vague as last time, you'll have round two of the same confusion. The British invented the English language, so plese put it to good use on the ballots why don't you? What was the last one about?? Thinking of leaving?? Where does the author get the absolutely idiotic idea that the government would campaign FOR Brexit ? Whatever happens now, the Conservative Party is going to pretty much destroy itself in the next 12 months. Hopefully the same will happen to Labour. 1) It's in the Tory Party's manifesto to take Britain out of the EU. Campaigning for Remain in a second referendum would be a blatant breaking of a manifesto promise. 2) Theresa May can hardly spend over two years trying to get Britain out of the EU and vowing to do just that and then suddenly start campaigning for Remain in a second referendum. Labour are also a party for Leave. It's also in their manifesto. So their Brexiteer leader Jeremy Corbyn - who's beeen wanting Britain out of the EU since the 1970s - would also campaign for Leave in the event of a second referendum. Corbyn voted Leave in the 1975 in/out referendum; he voted against the Maastricht Treaty in 1993 which created the EU out of the EEC; he voted against the Lisbon Treaty (EU Constitution) in 2008. Those undemocratic Remainers calling for a second referendum don't seem to have noticed this. Last edited by Blackleaf; Dec 16th, 2018 at 05:47 AM.. If I had a nickel for every time a political party broke a promise, I'd be a freaking bazillionaire. Sorry BL, if you think your political class actually want to leave the EU, you are sorely mistaken. They will do absolutely everything to stay in, rules, laws, policy, promises and the people be damned. The shock you are about to receive will be epic. I can only hope everyone who voted Leave the first time around would actually come out a second time. otherwise, you are royally screwed. Do you really think May would be so foolhardy as to start campaigning to keep Britain in the EU after spending over two years negotiating to get us out? That would be absolutely disastrous for her and her party. I'm also not too sure she would want to start campaigning for Remain in the unlikely event of a second referendum after spending two years campaigning to get us out and therefore just wasting two and a bit years of hard work. By the way, May has just launched a scathing attack on Blair over his calls for a second referendum, so it shows you what she thinks of such a thing. In London last week, Mr Blair said MPs might back a new vote if "none of the other options work". Labour MPs who back the idea have met cabinet minister David Lidington. On Thursday about 10 MPs met Mr Lidington, who is Mrs May's de facto Deputy Prime Minister, to argue for another public vote and make it clear there was no other government plan they could support. The government is opposed to any further referendum, saying the public made a clear choice when they voted in 2016 to leave by a margin of 51.9% to 48.1%. BBC political correspondent Chris Mason said Mrs May's criticism of the former Labour prime minister was striking for its anger. 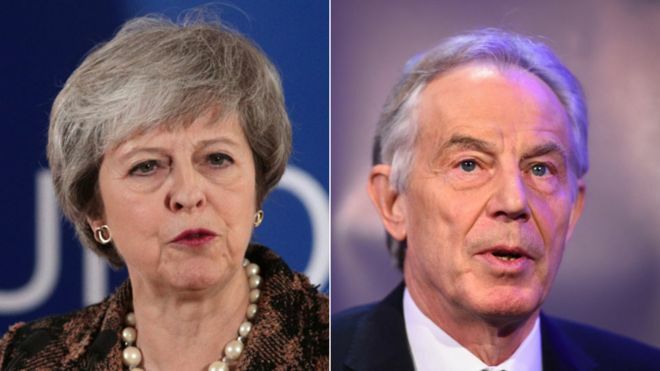 Mrs May said: "For Tony Blair to go to Brussels and seek to undermine our negotiations by advocating for a second referendum is an insult to the office he once held and the people he once served. She added: "We cannot, as he would, abdicate responsibility for this decision. Meanwhile, sources close to Mr Lidington told the BBC: "He's not planning for or advocating a second referendum. [He was] just meeting with MPs from all parties to discuss the deal and understand their views - pretty standard stuff when you're trying to win a vote." And the PM's chief of staff Gavin Barwell has responded to reports in the Mail on Sunday that he told colleagues another referendum was "the only way out of this", saying on Twitter: "Happy to confirm I am not planning a 2nd referendum with political opponents (or anyone else, to anticipate the next question)". MPs were due to vote on Mrs May's Brexit deal last Tuesday, but it was postponed when the Prime Minister admitted it would have been "rejected by a significant margin". After postponing the vote in Parliament, Mrs May travelled to Brussels to make a special plea to European Union leaders, in a bid to make her deal more acceptable to MPs. Many of Mrs May's Conservative MPs are concerned that the "backstop" - which is aimed at preventing a hard border in Northern Ireland - would keep the UK tied to EU rules and limit its ability to strike trade deals. Education Secretary Damian Hinds has told the BBC a second referendum would not end the deadlock over Brexit but might simply extend the impasse. Speaking on BBC Breakfast, he urged politicians to back the PM's plan, describing it as "balanced" and the "best of both worlds". Mr Hinds accused some in Parliament of "wishful thinking" in believing they will get something closer to their own view by rejecting Mrs May's deal, adding: "There is really no reason to believe that's true." Last edited by Blackleaf; Dec 16th, 2018 at 06:04 AM..
She could easily sit back and take no position, letting the Ministers and MPs campaign to Remain. Same with Labour, the vast majority of Labour MPs are Remoaners. Your point is taken that campaigning for Remain would expose a lot of hypocrisy in the UK system. Project Fear will be amped up to Project Hysteria, from all the usual suspects. As far as Blair goes, he has been running a 'government in the shadows' with all his trips to Brussels. Funny though, the guy who should be really upset about Blair is Jeremy Corbyn, and he hasn't said a word. Blair should be charged with treason for his activities, even Obama is more discreet with his interfering. Former PM John Major has come out and said Article 50 should be canceled. You know, in a civilized country, the former politicians usually have the good grace to shut up about current affairs. Brexit only shows how far the UK has really fallen to a 3rd world status. You still don't get it, your politicians will stop at nothing to stop the UK leaving the EU. So she would just sit back and allow her ministers just to completely waste the last two years of work and break a manifesto pledge and disobey a democratic decision? Yep. That'll get the voters clamouring to vote for the Tories at the next election. I already posted the Tories are fooked for the next election no matter what. If they really scupper Brexit, they won't see power for a generation at least. That's one reason why they would campaign for Leave in a second referendum. Not that there's going to be a second referendum anyway. I'm also certain Britain will pull out of the EU on 29th March with no deal - in other words, the full, proper Brexit that the people voted for. Another vote for Brexit could finish off the technocratic elite once and for all. We shouldn’t have to vote again. It is an outrage that some in the establishment are even considering making us vote again before they have enacted the thing we voted for first time round. In fact these second-referendum whisperings represent a ripping-up of the social contract of the modern democratic era, which says the public’s view must be taken seriously rather than casually written off by elites who think they know better. And yet I am warming to the idea of a second referendum. Or rather, if they make us do it I will relish it. Why? Because a second vote for Brexit might finish off the EU and its elitist backers once and for all. The Remainer section of the UK’s political class – which of course is the vast bulk of the UK’s political class – are right about one thing: we know so much more now than we did in the run-up to the referendum. This is their rallying cry for another vote. ‘The public is more informed now. It has greater knowledge. And so it should be asked to vote again.’ They’re right, but not in the way they think they are. We do know more now – we know just how anti-democratic and ruthless the EU is; we know just how duplicitous our own political class is; we know the depths of the contempt that they hold us in; and we know that voting for Brexit was the most sensible, rational and important thing most of us have ever voted for in our lives. The past two-and-a-half years have been wonderfully clarifying. Not in the way Remainers think. Not because us moronic plebs have now realised that the NHS promise plastered on the side of a bus was misleading (I haven’t met a single person who voted Brexit because of that bus). Not because we have learned just how damaging and destructive leaving the EU will be – most of us know this is the politics of fear designed to terrify us out of our principled opposition to the EU. No, the past two years have been clarifying because they have proven the truth of all the things that us Brexit supporters believed or at least suspected: that the EU railroads over national democracy, that the British political establishment is cloth-eared to our concerns, and that democracy is not held in very high esteem by our rulers. The foul treatment of the UK’s elected political leaders by the unelected oligarchs of the European Commission; the obstinacy and mendaciousness of the EU negotiators; the EU’s efforts to make an example of disobedient Britain in order to terrify other EU member states away from the idea of ever trying to leave; the way the supposedly liberal establishment in the UK has talked about voters as ‘low information’, visceral, self-destructive and clueless; the post-Brexit calling into question of the very idea of democracy by Britain’s bruised and bitter technocratic class; the House of Lords’ rediscovery of its medieval-style agitation with democracy and with the plebs who make up a democracy; the fact that we were told that our decision on EU membership would be final and would be acted upon when neither of those things turned out to be true… all of these events of the past two-and-a-half years have clarified 21st-century politics in a way even those of us who were never big fans of the EU or the UK political establishment could only have dreamt of. So yes, we know more now. We know how much you distrust us. We know how much you fear and loathe us. And we know how little respect you have for our fundamental democratic right to steer the fate of the nation. More importantly, we know how much Brexit wounded your political authority. You want to make us vote again now that we are armed with such a wealth of information about the EU establishment, our establishment, and their joint contempt for the rights and dignity of British voters? Do it. We dare you. 2. Unilateral global free trade within seventy years with steps to be taken in that direction within five years. To vote for May's plan would be to vote for the softest Brexit imaginable. To vote for the second option would not necessarily contradict May's plan but would accept it only as a short-term option with an expectation that the government take moderate steps towards a harder Brexit over time. The word 'within' in the second option would allow a hard-Brexit Parliament to accelerate a hard Brexit while allowing a soft-Brexit Parliament to drag its feet a little more but still with the understanding that the people expect May's plan to serve only as a starting point towards a harder Brexit over time. The only question in the second option is how quickly a hard Brexit should be implemented. But I don't see the point of a remain option when the people have already voted to leave. The only question now should be in what manner they want to leave. Last edited by White_Unifier; Jan 6th, 2019 at 12:30 PM.. So basically you want a second referendum where the choices are Leave or Leave. Well, if a majority of politicians want to leave then pack up and leave. What's the song and dance about? Wouldn't a remain option be redundant given how the people have already voted to leave? Yes we can argued that people can change their minds, sure. But there was already an election after the referendum and again the people voted for a leave Parliament. Now should the people elect a remain Parliament before the next referendum, then a remain option might make sense. But until that happens, we must reasonably conclude that the people have not yet changed their minds and so until they do so by electing a remain Parliament, you should move forward, not backward. Also, when we consider how the main problem with the last referendum was the ambiguity of the leave option, the next referendum could fix that problem by providing at least somewhat more precise options. I'll add one more point here. When we consider how some leavers probably voted remain (as I would have) precisely due to the excessive ambiguity of the leave option, we can reasonably conclude that a more precise, moderate, and realistic leave option might attract even more leave votes. For example, a government could fulful the option of 'unilateral global free trade within seventy years with concrete steps to be taken in that direction within five years' by simply unilaterally reducing tariffs by a small amount on a particular product from a particular country every five years. If a government is expected to just do that every five years, most people would consider it a perfectly attainable goal towards an ever harder Brexit over time while giving businesses plenty of time to adapt. When we consider how the main challenge to a hard Brexit involves the UK's extreme integration into the EU, a gradual shift towards unilateral global free trade would contribute to a gradual disentanglement of the UK from the EU so as to lay the groundwork for a harder Brexit in future. Last edited by White_Unifier; Jan 6th, 2019 at 01:51 PM..
Young people are vehemently anti-Brexit and Brexiteers have stolen their future? That's what Remainers tell us. Channel 4’s Brexit debate burst some Remainer bubbles. Last night, Channel 4 News invited a studio audience of 18- to 20-year-olds in Leeds to give their views on Brexit. Given the familiar narrative that all young people are passionately pro-EU and have had their futures stolen by their backward Brexiteer grandparents, it is fair to say the debate didn’t exactly go to plan. WATCH | "You're all Leavers? Leavers?" From the start, Leaver after Leaver made articulate and passionate arguments for respecting the result of the referendum and for leaving the EU. The first speaker denounced Remain campaigners for ‘patronising’ the young with talk of ‘cheap flights’ while ignoring more substantive issues in Europe. He said the EU imposed a ‘neoliberal straightjacket’ and disastrous austerity policies on its member states. Young Leavers raised important points around trade, national sovereignty and democracy. Jon Snow, who fronted the debate, was visibly shocked at times. Clearly he and the producers expected a pro-EU whingeathon. A producer revealed that two-thirds of the audience were pro-Remain, reflecting the latest polling of young voters. In a pre-recorded segment, Snow posed as the voice of all young people. He put a question to Labour leader Jeremy Corbyn, who was also in Leeds to deliver a speech on Brexit, asking if he had ‘forgotten young people’ by refusing to back a so-called People’s Vote. This fell flat completely when it transpired that even among the Remain-leaning audience, there was little enthusiasm for a rerun of the referendum. Pro-Remain panellist Femi Oluwole complained of pro-Brexit bias in the debate, despite the favourable audience composition. ‘The stats’ show young people are ‘massively anti-Brexit’, he said. But just because a majority of young people are Remain-leaning, that does not make them ardent Remoaners. During the debate, one of the most passionate defences of democracy came from an audience member who said he would have voted Remain but also said he believes the 2016 vote for Brexit must be respected. A second referendum ‘devalues the vote’ and ‘messes around with democracy’, he said. It was clear in the discussion that the momentum was with Brexit. All the young Brexiteers were energised and excited by the possibilities that a radical break with the status quo could offer. We need to encourage more young people to see that the future is theirs to shape. Fraser Myers is a staff writer at spiked and host of the spiked podcast . Follow him on Twitter: @FraserMyers.